Amazon Premium content can offer a great way to showcase your brand. But this new form of enhanced content poses some challenges to brands. 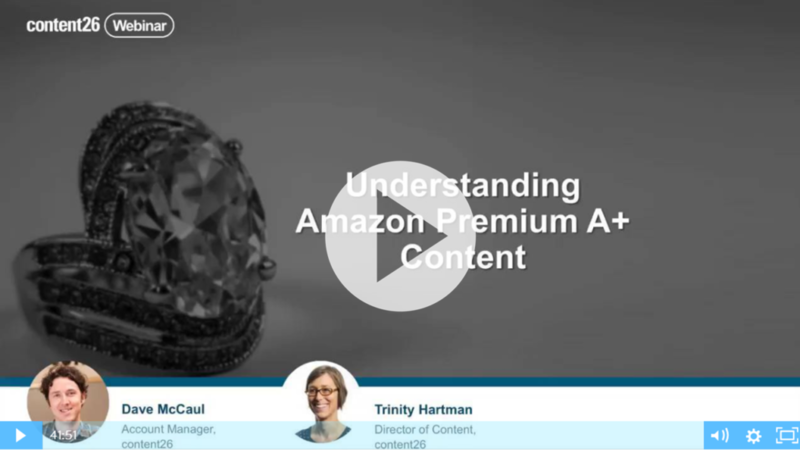 This hour-long Amazon Premium content webinar will help you decide whether Premium A+ is worth the investment and provide tips for those deciding to move forward with Premium A+ content. After nine years of working with Fortune 500 companies on their ecommerce content, Dave has a lot to say about UX, mobile design, and effective copywriting. When he’s not on the clock, Dave writes novels, plays piano, and produces feature-length films (not necessarily in that order). Originally from Fargo, North Dakota, Dave plans to die here in Seattle where it’s green and fertile. A former cheesehead, Trinity’s writing career has taken her from the Northwest to Europe and back again. Trinity has spent the past 7 years immersed in the world of ecommerce content and advertising. She spends much of her free time fermenting things and playing accordion.